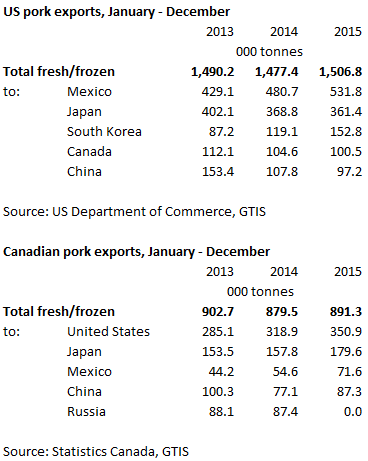 US and CANADA - US pork exports in 2015 increased by 2 per cent year on year to just over 1.5 million tonnes. Canadian pork exports recorded a slightly smaller increase of 1 per cent year on year. Shipments from the US in the last quarter of 2015 increased by 9 per cent from the previous three months, which helped to contribute towards the overall yearly rise. Once again, Mexico was the largest importer of US pork, with 35 per cent of total shipments going to the country and volumes increasing 11 per cent on the year. China was bumped down to the fifth largest export destination, with its percentage share of total US exports decreasing, as 10 per cent less pork was shipped year on year. US exports to Japan also decreased on the year, albeit at a slower rate. All was not lost for the US, in terms of the Asian markets, as shipments to South Korea increased by nearly 30 per cent on the year to 152,800 tonnes. The average unit price of pork exports decreased by $0.63/kg (19 per cent ) in 2015 compared to 2014, as the strength of the dollar hit competitiveness against other major exporters. This left the total value of pork exports at just over $4 billion, down by 18 per cent year on year. Similar to the US, an increase in Canadian exports of 12 per cent in the last quarter of the year contributed to the overall annual rise. In 2015, the US remained the main destination for Canadian pork, with shipments increasing by 10 per cent to 350,900 tonnes, which is 40 per cent of total exports, although sales in the last quarter were down on the year. Volumes destined for Mexico also increased by 31 per cent . Unlike the US, shipments to China and Japan both increased, by 13 per cent and 14 per cent respectively, in 2015. South Korea also imported 4 per cent more Canadian pork compared to 2014. This enabled the Canadian industry to offset the loss of the Russian market, which took over 10 per cent of its exports prior to the ban imposed in August 2014. The value of Canadian pork shipments decreased less than that of the US due to the weaker Canadian dollar, down 8 per cent to total C$2.9 billion in 2015.